45. Herzberg G., Phys. Rev., 69, 362 (1946). 46. Herzberg G., Nature, 163, 170 (1949). 48. Herzberg G., Can. J. Res., A28, 144 (1950). 50. Herzber G., Mem. Soc. Roy. ScL Liege Coll., ser. V, XVI, 121 (1969). 51. Herzberg G., Teller E., Z. Phys. Chem. Abt., B21, 410 (1933). 52. Herzberg L., Herzberg G., Astrophys. J., 105, 353 (1947). 53. Hougen J. T., J. Chem. Phys., 36, 519 (1962). 54. Hougen J. T., J. Chem. Phys., 37, 1433 (1962). 55. Hougen J. Tn J. Chem. Phys., 39, 358 (1963). 56. Hougen J. T., Can. J. Phys., 42, 1920 (1964). 57. Hougen J. T., Can. J. Phys., 43, 935 (1965). 58. Hougen J. T., Methane Symmetry Operations, в ки. MTP International Reviews of Science, Physical Chemistry, Ser. 2, vol. 3 (ed. Ramsay D. A. ), Butterworth, London, 1976. 59. Hougen J. T., Bunker P. R., Johns J. W. C1 J. Mol. Spectrosc, 34, 136 (1970). 60. Hougen J. Г., Watson J. K. G., Can. J. Phys., 43, 298 (1965). 61. Howard B. J., Moss R. E., Molecular Phys., 20, 147 (1971). 62. Hoy A. R., Mills I. M., J. Mol. Spectrosc, 46, 333 (1973). 63. Hoy A. R., Mills 1. M., Strey G., Molecular Phys., 24, 1265 (1972). 64. Hwa R. C, Nuyts /., Phys. Rev., 145, 1188 (1966). 65. Jackels C F., Davidson E. R., J. Chem. Phys., 65, 2941 (1976). 67. Jungen С., Merer А. /., в кн. Molecular Spectroscopy: Modern Research, Vol. II (ed. Rao K. N.), Ch. 3, Academic Press, New York, 1976. 68. King G. W., Hainer R. M., Cross P. C, J. Chem. Phys., 11, 27 (1943). 69. Ландау Л. Д., Лифшиц Е. М. Квантовая механика, нерелятивистская теория. — M : Физматгиз, 1963. 70. Longuet-Higgins 11. 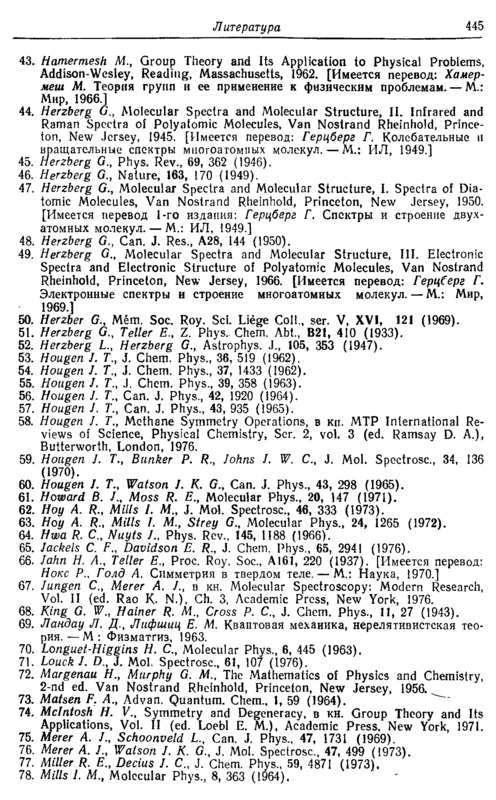 С, Molecular Phys., 6, 445 (1963). 71. Louck J. D., J. Mol. Spectrosc, 61, 107 (1976). 72. Margenau H., Murphy G. M., The Mathematics of Physics and Chemistry, 2-nd ed. Van Nostrand Rheinhold, Princeton, New Jersey, 1956. 73. Matsen F. A., Advan. Quantum. Chem., I, 59 (1964). 74. Mcintosh H. V., Symmetry and Degeneracy, в кн. Group Theory and Its Applications, Vol. II (ed. Loebl E. M.), Academic Press, New York, 1971. 75. Merer A. J., Schoonveld L., Can. J. Phys., 47, 1731 (1969). 76. Merer A. J., Watson J. K. G., J. Mol. Spectrosc, 47, 499 (1973). 78. Mills 1. M., Molecular Phys., 8, 363 (1964).